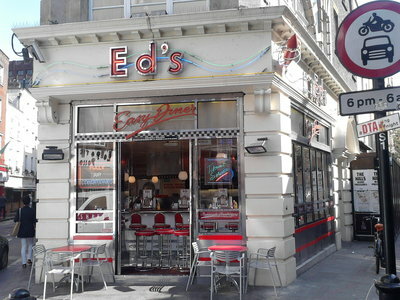 Some places in London have that rare ability to transport you not just to another place, but another time - Ed's Easy Diner is just one of those places. Walking through the door transports you to the kind of diner made famous in such cult classics as Happy Days. The decor is chrome-retro, the music resolutely '50's, and the food the kind of comfort-food staple that will see you breaking all your dieting rules for a day, or perhaps two! The order of the day is hamburgers, fries, hot dogs and milkshakes - though two recommendations for you would have to be the famous ice-cream floats (try cherry coke and vanilla float if you can, I defy you not to like it!) and the New York-style Say Cheese cheesecake. Out of the 6 locations available, the Soho diner is the original, standing out proudly on the corner of Moor Street and Old Compton Street, especially at night, when the neon lights come on to tempt people inside. It's quite small on the inside, but clean, brash and the kind of place that will give you free refills for your coffee, so why argue? Come in, take a seat (they don't take bookings), put 20p into your own personal table jukebox, and allow Elvis et al transport you to a time when quiffs and leather jackets with the collars turned up was the ONLY way to dress! Why? because you always wanted to be in Grease the movie! I love the whole retro look and feel to Ed's: it's a simulacrum of the 1950s diner that we never had in this country. I'm surprised you only gave the milkshakes a brief mention. As far as I'm concerned they're the best in London, guaranteed to raise your cholesterol by a few points, and perfect for sharing!